(ABOVE) There are so many gorgeous classic items this Fall 2017! I am so impressed with fall offerings this year. 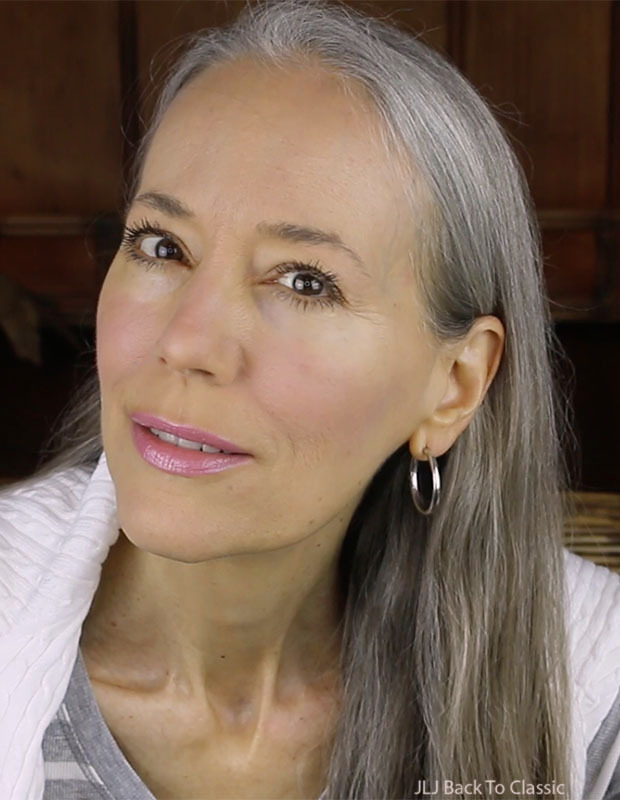 Yes, there are still lots of trends I don’t see myself wearing–some, in fact, that I can’t imagine anyone of any age wearing…ever–but stores are also showing plenty of gorgeous classics, too, and I rounded up 65 of them just for this post. Some of the items are on sale, which is fantastic, but those are also the ones that often go first. I ordered several pieces a week ago, for example, only to be informed yesterday that one of them was not available after all. 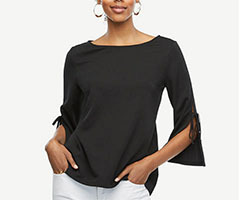 Everything I show from Talbots is part of their Talbots 25% Off Style Event, but only for a limited time (Through September 4). Over at At Ann Taylor, they’re having their Ann Taylor 20% Off/30% Off/40% OFF Event, but only for the next two days (Through August 28). So if you’re interested in anything, you might want to order sooner rather than later. 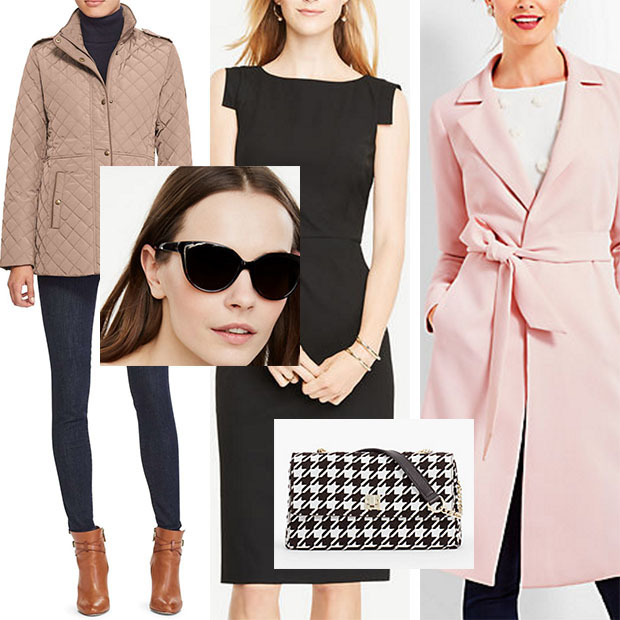 Some of my favorites this year are the Scarf-Print Cardigan, Leather Houndstooth Shoulder Bag, Refined Crepe Trench, Quilted Hooded Vest, Printed Slim Ankle Pant, Foulard-Print Messenger Bag, and Faux-Leather Pleated Skirt. There are oodles more, too, and all are below. Thank you for taking the time to visit my blog. Happy shopping! (ABOVE) Talbots Refined Crepe Trench (Was $229, Currently $171.75; Available in 2 Colors), Talbots Pom Pom Top With Bow Back (Was $109, Currently $81.75; Available in 3 Colors), Talbots Black Slim Pant. What a smart idea–this light-weight Crepe Trench (instead of a blazer) over a Winter White Top and Slim Black Pants. So elegant. I want this whole outfit–with this pair of Black Suede Pointy Toe Flats. I also would wear this trench over a LBD or shift/sheath dress–the same length of slightly shorter–in burgundy, winter white/ivory, mint or navy blue. So lovely! 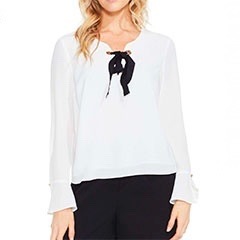 (ABOVE) Ann Taylor Slit-Sleeve Top (Was $59.50, Currently 20% off 1 Item, 30% Off 2, etc. ; Also Available in Winter White). Isn’t this Slit-Sleeve Top pretty? I love that the subtle slit and bow are just below the elbow–at that sweet spot where the arm is most narrow. So feminine! 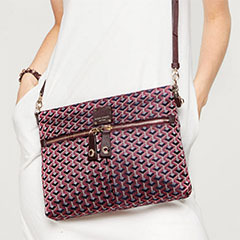 (ABOVE) Talbots Houndstooth Shoulder Bag (Was $139, Currently $104.25). 11″ x 6″ x 4″. 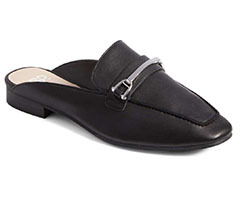 (ABOVE) Talbots Faye Nappa Leather Loafer (Was $119, Currently $89.25; Also in Camel or Black). Blush pink. Teeny leather black bow. Slightly pointy toe. Black piping. Imagine them with the Houndstooth Bag above. Enough said. (ABOVE) Talbots Quilted Backpack (Was $109, Currently $81.75; Available in 2 Colors). I have a Black Quilted Bag and love it. I wear it with refined pant-and-top outfits and also with jeans and casual skirts and dresses. It’s a softer alternative to a leather bag. This one serves double duty, because it also has backpack straps; so you can wear it handsfree. 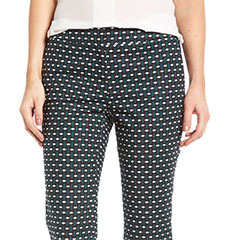 (ABOVE) Ann Taylor Modern All-Day Skinny Jeans (Were $89,Currently 20% off 1 Item, 30% Off 2, etc.). I have several pairs of Colored Skinny Jeans, including a pair that’s pastel pink like these. I wear them with white, ivory, black, navy, burgundy, and gray tops. Speaking of burgundy, doesn’t the color look terrific on those jeans above? I think this Quilted Field Jacket paired with a black, cotton-blend Turtleneck is gorgeous. So sleek but warm and comfortable. Slip into black skinny pants and black low-heeled ankle boots and it looks just as appropriate in the city or country (or Florida!). Such a clean-lined, sophisticated ensemble. This jacket-turtleneck-black-pants outfit would look wonderful with the Marc Fisher Yale Chelsea Boot I show below! (ABOVE) J. Crew Faux-Leather Pleated Skirt ($120); Also Halogen Faux Leather Pleated Skirt ($119) and Black Turtleneck (Talbots Long-Sleeve Turtleneck Was $34,Currently $25.50; Available in 8 Colors). This whole outfit is fabulous. It’s simple, sophisticated, minimal, and yet very feminine. I found two versions of the Faux-Leather Pleated Skirt–both are $120 or less. Doesn’t it look like something Audrey Hepburn would wear? The Quilted Vest is a classic preppy item of which I own several. I wear them all winter here in Florida. Sometimes I pair them with just a long-sleeve tee, but when the weather gets colder I slip them over turtlenecks or button-up shirts and sweaters with jeans. I have one in ivory, and I love it with white jeans. However, mine doesn’t have the added hood. I think that is so neat. 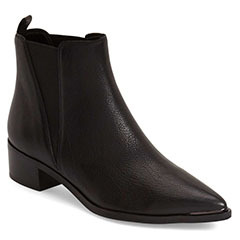 (ABOVE) Marc Fisher Yale Chelsea Boot (Was $179.95; Currently Price Matched at $143.96). 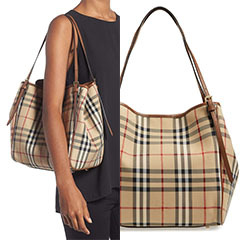 (ABOVE) Burberry Small Canter Check And Leather Tote ($895). If you love tan and brown with black, then you’re probably like me and love Burberry’s classic plaid. I love it on their scarves, inside their trench coats and, of course, on their bags. This one, I think, is a great size and shape. I think it looks wonderful above with that all-black ensemble. Of course, it also would pair well with neutrals. (ABOVE Lauren Ralph Lauren Faux-Leather Trim Trench Coat ($190; Available in 4 Colors). This Trench is so good looking. I love the navy contrasted with brown, leather-look trim. I love it paired with the brown pants and off-white top, above, but I’d also have fun matching the trim to my handbag and/or shoes or boots. Also fun would be to pair this trench with navy Hunter Boots (below). I have two trench coats and I wear them all year here in Florida. 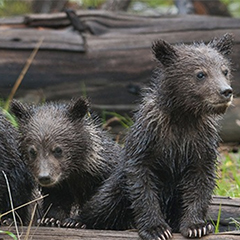 They provide just enough added warmth for our chilly winter weather and also protection from rain. When it gets really cold, I layer on a wool sweater underneath. 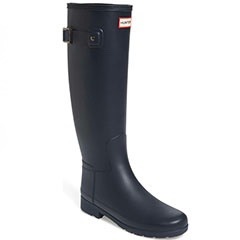 (ABOVE) Hunter Original Refined Tall Rain Boot ($165). (ABOVE) Moon And Lola Personalized Monogram Bracelet ($68; Available in 2 Colors). See also the Moon and Lola Personalized Monogram Ring ($68; Available in 9 Colors). 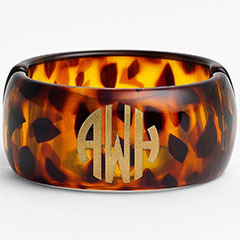 I have a Monogrammed Faux-Tortoise Bracelet similar to this one and get so many compliments on it. I wear it with refined black and brown outfits, but also with fun and preppy casual outfits of bright pink, navy, and lime green. I also wear a tortoise-style watchband, earrings, necklaces, sandals, and ballet shoes. That’s how much I love tortoise! (ABOVE) Halogen Scallop Sweater ($59, 6 Colors) and Halogen Slim Ankle Pant. ($79, 3 Colors). This outfit is so clean and classic; it will work right through to next summer. 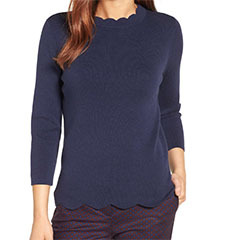 The Sweater is a classic crewneck style but is made more interesting–and feminine–because of the scalloped neck and hem. I also like that it has no wool (it’s cotton, viscose, nylon and spandex) and comes in six gorgeous colors, including blush and ivory. 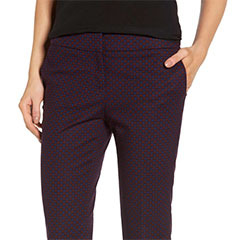 As for the Pants, I love the tiny burgundy dot print pattern of navy and black on a burgundy background, because it easily pairs with both navy and black tops (or ivory, white, gray or merlot). I think the fit is lovely–not too tight or too loose. It also comes in a gorgeous green print and in solid black. I love, love the foulard-like pattern! (ABOVE) B.P. Milo Loafer Mule ($79.95; Silver Embellishment; Available in 3 Colors). More Loafer Mules Here. 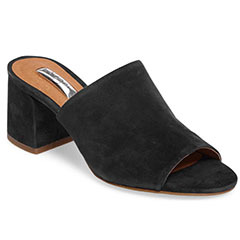 Mules are a fun alternative to a loafer, and the black version is the most classic of them all. I love how these look with the Burgundy Slim Ankle Pant and Navy Scallop Sweater above. I would have normally reached for a navy flat, but I love the reminder of how gorgeous black looks when paired with navy. If you’d prefer a gold rather than silver embellishment on the shoe, see the Michael Michael Kors Nadia Loafer Mule, which I show further down the page. 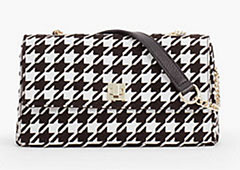 (ABOVE) Henri Bendel Jetsetter Foulard Convertible Messenger (Was $198; Currently 20% Off $150). Something about a foulard print in anything makes me happy. It’s a similar thing I have with stripes. I love both of these patterns–alone and together. This Foulard Messenger is such a pretty color. Along with off white or ivory, it would pair beautifully with black or navy, as well as gray or burgundy. Can’t you just see it thrown over a black blazer, white button up shirt, and blue jeans? (ABOVE) Talbots Social Butterfly Tweed Jacket (Was $199, Currently $149.25) and Talbots Silk Charmeuse Shell (Was $99, Currently $74.25). Whether paired with a black skirt or pant, this is a perfect dressy ensemble. Just lovely! 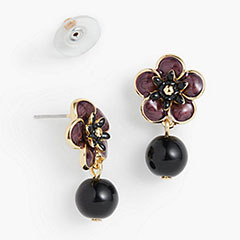 (ABOVE) Talbots Flower Stud and Bead Drop Earrings (Were $29.50, Currently $22.12). 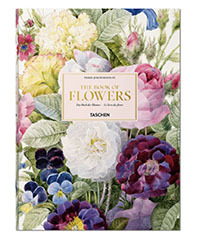 These would look so pretty with the Tweed Jacket and Silk Charmeuse Shell I show above! 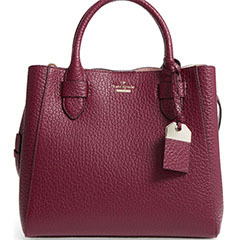 (ABOVE) Kate Spade Carter Street Devlin With Detachable Shoulder Strap ($378; Available in 4 Colors). This is just a gorgeous Top-Handle Bag. The size, the shape, the extreme-pebbled leather…and, oh my gosh, that color! The Kate Spade team is so good at what they do. Love this! 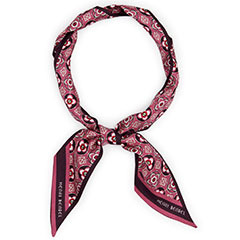 (ABOVE) Henri Bendel Silk Foulard Skinny Scarf (Was $48, Currently 20% Off $150). Such a classic! 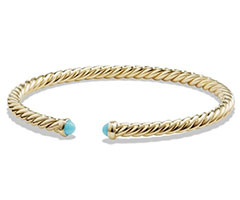 This would be pretty wrapped around your wrist or neck, tied in your hair, or twisted around the top handle of your black, burgundy, pastel-pink, winter white, or ivory handbag. (ABOVE) Halogen Scallop Sweater ($59, 6 Colors) and Halogen Slim Ankle Pant ($79, 3 Colors, Including Solid Black). These are the same Sweater and Pants featured above in navy blue and black with burgundy, but this time in this luscious black and ivory with a rich green. I’m enamored of this style of print, because it reminds me of foulard-print scarves, which I love. Plus, this pant and sweater have the simple, clean lines that I think are so flattering to any figure. 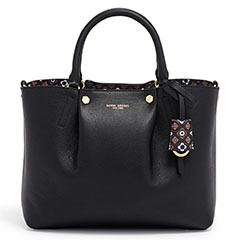 For more foulard-print items, see the Henri Bendel Satchel (also shown below). 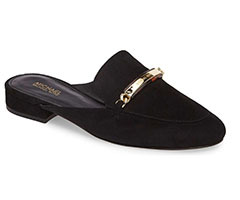 (ABOVE) Michael Michael Kors Nadia Loafer Mule ($114.95; Available in 3 Colors). More Loafer Mules Here. When I feel like a loafer but want a more feminine look, I wear a Loafer Mule. I’ve had mine for about 10 years and wear them with pants, jeans, and shorts. (ABOVE) Henri Bendel Leather Satchel With Foulard Print (Was $350, Currently 20% Off $150; Available in 5 Colors). If you love foulard prints, then have a look at this Leather Satchel. It’s available in five color variations, and is such a nice size. 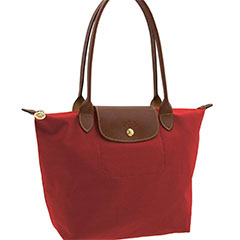 Plus, it offers both top handles and a longer, detachable shoulder strap. Such a great looking bag. See more Henri Bendel Foulard-Print items. (ABOVE) Talbots Check Tweed Wrap Skirt (Was $109, Currently $81.75) and Talbots Perfect White Shirt (Was $79.50, Currently $59.62). A White Button-Up Shirt with a Slim-Fit Skirt is a favorite combination for me. I pair it with a jacket or cardigan and pumps or boots, and I’m good to go. The ensemble above is even more interesting, because the skirt is a gorgeous black tweed wrap embellished with three gold buttons. I’d love it with the black cardigan below! (ABOVE) Ann Taylor Ann Cardigan ($69.50, 5 Colors); Talbots Charming Cardigan (Was $79.50, Currently $59.62; Available in 12 Colors). 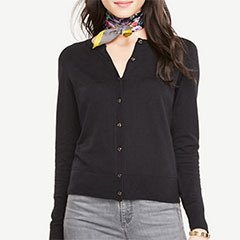 Ann Taylor brings back their wonderful Ann Cardigan every year in a variety of colors and configurations. Plus, I was thrilled to see that Talbots decided to bring back their classic slim-fit (no pockets–my favorite) Charming Cardigan this year, too! In 12 colors! Please, Talbots, keep bringing back this no-pocket version! So, when you need a cardigan, be sure to visit Ann Taylor and Talbots. I have several styles of cardigans from both stores–long, cropped, in between, short sleeve, long sleeve, three-quarter sleeve, cotton, silk, or blends–because they’re so versatile. As for a black cardigan, I can wear the same one with jeans, a pencil skirt, even a full-length taffeta skirt for a black-tie event. Absolutely love a cardigan! If you prefer a slightly looser fitting cardigan, you might have a look at the Talbots Charming Cardigan With Pockets. (ABOVE Prada Saffiano Leather Tote (Was $2,100, Currently $840-$2,100; Available in 3 Colors) . More Prada Saffiano Bags and Accessories Here. I have this Prada Tote in the color Sabbia, which is a light beige color. 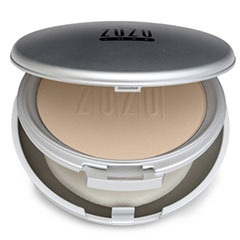 The one above is the color Cammeo, which is a soft beige blush. See me carrying mine here (please excuse the awful photos). Pradas are definitely an investment, but if you take care of them they should last a lifetime and then some. I have collected a total of three styles of this bag over the years, and I love all of them. They truly are beautiful classics. See my others here. (ABOVE) Ann Taylor Seasonless Stretch Black Sheath Dress ($129, Currently 20% off 1 Item, 30% Off 2, etc.). If I didn’t already have several sleeveless LBDs, I would buy this one. In fact, I prefer this one to mine, which are totally sleeveless. This one has slight cap sleeves, so you don’t need to worry about underthings showing. It’s also a sheath (fitted at the waist), rather than a shift (not fitted at the waist), so it accentuates the narrowest part of a woman’s torso. All around, this is a great LBD–and the price is terrific. 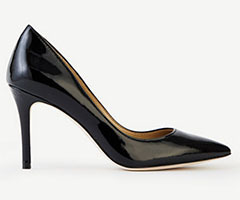 (ABOVE) Ann Taylor Mila Black Patent Leather Pumps ($128, Currently 20% off 1 Item, 30% Off 2, etc.). 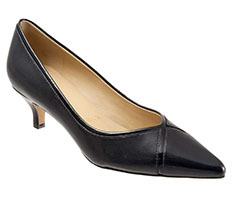 These Black Pumps would look lovely with the LBD above. And, yes, I agree, they are a very high heel. However, I can’t imagine not having at least one pair in a woman’s wardrobe. 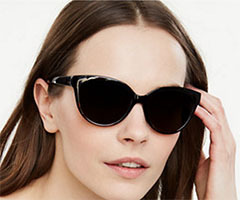 (ABOVE) Ann Taylor Cateye Sunglasses ($48, Currently 20% off 1 Item, 30% Off 2, etc. ; Available in 3 Colors). These would look gorgeous with the LBD and Black Pumps I showed above. Or…with absolutely anything else. 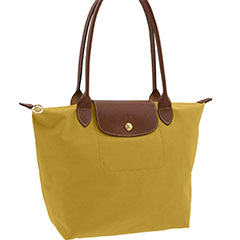 (ABOVE) Longchamp Small Le Pliage Shoulder Tote ($125; Available in 11 Colors; Other Sizes, too). If you follow my blog you know I love this Nylon and Leather Tote. I have it in several colors and carry it year round with shorts, skirts, jeans, pants, and dresses. My favorite way to wear it is to match my shoes to the brown leather handles. I have this color and love it with black, navy, or white. (ABOVE) Talbots Status-Print Charming Cardigan (was $89.50, Currently $67.12) and Talbots Buffalo-Check Shirt (Was $69.50, Now $52.12). I knew I wanted this Cardigan as soon as I saw it. It reminds me of a silk scarf. I would never have thought to put it with the saffron Check Shirt, but I love the combination. The sweater features both black and indigo blue, along with red and saffron. The colors are beautiful together, so I know I can pair it with any of those colors and my outfit will look lovely. 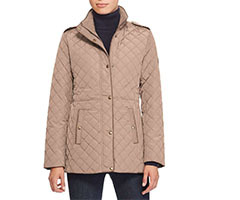 (ABOVE) Talbots Quilted Military Jacket (Was $159, Currently $119.25; Available in 4 Colors). 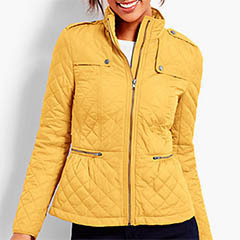 I bought a pumpkin-color Quilted Jacket from Talbots last fall, and I can’t wait to wear it again this winter. I love this one in Saffron. 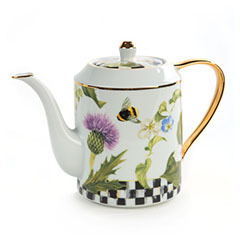 It’s a fun way to add bright-and-cheeriness to an otherwise chilly, overcast day. It also comes in a striking bright red, as well as black and ivory. I own one in khaki, too, and like to wear them instead of a blazer or heavy sweater. Up north, it will easily take you through the fall and then will be perfect come spring, too. 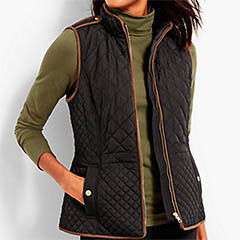 (ABOVE) Talbots Quilted Barn Vest (Was $119; Currently $89.25; Available in 6 Colors). I have a black Quilted Vest and wear it so much. I particularly like it paired with a denim shirt and white skinny jeans or my black-and-white striped long-sleeve tee and jeans. It’s such a perfect weight for when the weather is chilly but I don’t want to wear a coat or jacket. I thought this one was especially good looking because of the brown contrast tipping. I love mixing black with brown! 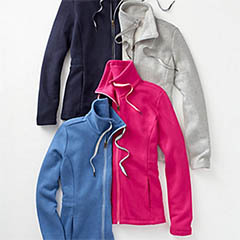 (ABOVE) Talbots Merino Sweater Jacket (Was $149, Currently $111.75; Available in 7 Colors). This is a great alternative to a blazer or cardigan, and the epaulettes and gold buttons are what make it special. On line it’s shown being worn fully buttoned. I think it would look great with black pants and a black turtleneck that way. Of course, you can always wear it completely unbuttoned–with a silk shirt or camisole–but I also think it would look good with just the top one or two buttons undone and a double strand of pearls peeking out underneath. 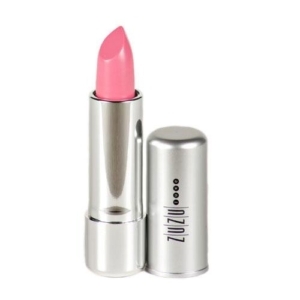 It’s taking every ounce of self control to keep me from ordering this color. 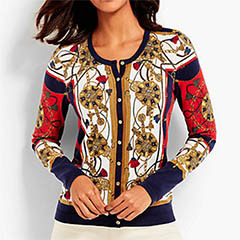 It would look wonderful with black, navy, red,, or ivory–all the colors in the Talbots Status-Print Charming Cardigan I showed above. (ABOVE) Talbots Scollop Hem Jacket (Was $149, Currently $111.75; Available in 3 Colors ) and Halogen Slim Ankle Pant ($79; Available in 3 Colors). More Black Slim Ankle Pants Nordstrom, Talbots, Ann Taylor. If you ever wondered how to pair navy with black, this is a great example. I love how there isn’t even a blouse showing (although you could certainly wear one). It’s just so sleek and simple–one long, lean column–and because the Jacket is navy, not black, it softens the whole look. (ABOVE) Halogen Black Slide ($89.95). More Black Slides Nordstrom. I still have and wear the Block-Heel Slides I bought in the 90s. They are a great alternative to sandals, and work especially well when transitioning from summer into fall and then winter, because they offer more coverage. If you only buy one pair, I’d make it black. They go with everything. 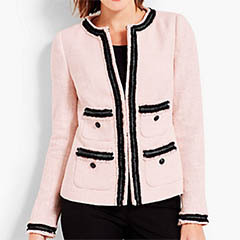 (ABOVE Talbots Provence Tweed Jacket (Was $179, Currently $134.25; Available in 2 Colors). This would look just as lovely under the Tweed Jacket above as it would with blue jeans and black loafers. The subtle bell sleeves and the black ribbon are such pretty, feminine touches. (ABOVE) Trotters Kelsey Pointy Toe Pump ($139.95; Available in 4 Colors, 3 Widths). I have this Pump and love its two-inch heel. It’s just high enough to lengthen my leg, but still low enough to be comfortable when I have to walk a long distance or be on my feet for awhile. (ABOVE) Halogen Crewneck Cashmere Sweater ($89; Available in 4 Colors). 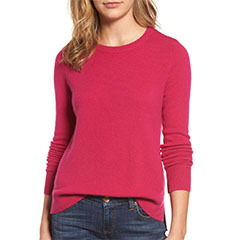 This is such a classic Sweater–and it’s in bright pink. I love the simple lines of it. I think it would look terrific with a white crewneck tee peaking out underneath–with black skinny pants and black ankle boots. It also would be pretty with a pencil skirt and button up shirt underneath–and black pumps. Such a classic silhouette. I own this Jegging in two colors and it’s my favorite skinny jean. It’s so comfortable and the fit is amazing. I especially love, love the high waist–because I’m so long in the torso. See me in these jeans here and here. (ABOVE) Talbots Ryan Eiffel Tower Embroidered Flats (Were $129; Currently $96.75). These are so cute and preppy! Adorable with bright solid and printed shorts, skirts, and sundresses. This wool and nylon Fringed Plaid Wrap would look gorgeous over a little black shift or sheath dress. 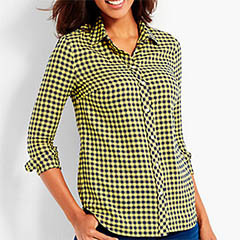 It would also look great with black pants and a white blouse or jeans and a gray or black long-sleeve tee. It’s such a versatile alternative to a sweater or jacket. If you love feminine classics–and have chilly, overcast winter weather–take a look at this Ruffle-Neck Wool Jacket and Wool Ruffle-Trim Sweater. What a stunning color of pink, and the white ruffle on the sweater is the perfect feminine touch. 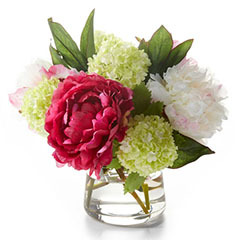 A pretty way to bring happy and bright into cold and blustery days! (ABOVE) Talbots Fringed Festive Tweed Sheath Dress (Was $159, Currently $119.25) and Talbots Waterweave Cashmere Wrap. (Was $159, Currently $119.25; Available in Pink, Black). This Sheath Dress looks so pretty with the Hot Pink Cashmere Wrap. It also would look great with a white button-up blouse underneath or a pink or black cardigan tied loosely around the neck. (ABOVE) Talbots Francesca Bow-Front Driving Flats (Were $119, Currently $89.25; Available in 7 Colors). 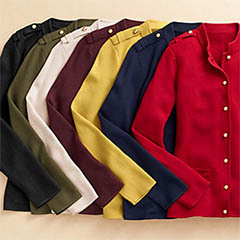 (ABOVE Talbots Autumn Fleece Jacket (Was $79.50, Currently $59.62; Available in 4 Colors). I don’t think I will ever give up wearing Fleece Zip-Up Jackets for my casual wear. They’re so cute and comfortable for lounging cosily at home or for a quick run to the market. Pop a tee or cami underneath, and all of the colors above would look good with black, white, ivory or navy yoga pants, athletic pants, jeans, shorts, or a skort. 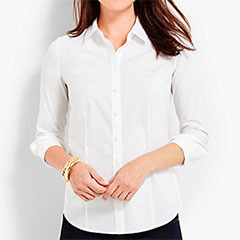 (ABOVE) Talbots Ruffled Denim Shirt (Was $79.50; Currently $59.62). I tried this on in the store about a month ago and I really liked the look of it a lot, but my normal size of extra small (in most brands) was a bit generous on me in the shoulders and bust. At that time, Talbots wasn’t carrying a petite version of it in the stores or on line, but they are now. So, if you want this, you might size down if you like a shirt that’s a bit more fitted. I did that with Talbots’ Portrait Collar Shirt that I bought and featured in my July Favorites post as well. 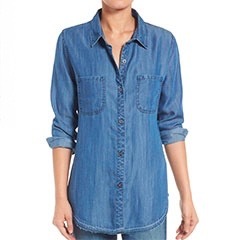 (ABOVE) Rails Carter Chambray Shirt ($148). I love the look of this lyocell Chambray Shirt and own one just like it, in cotton. 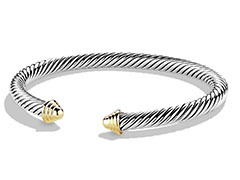 It’s a classic version of a timeless piece that never goes out of style. I think this one is the perfect color of denim; it goes well with so many items. I pair mine with white, black, or camel. 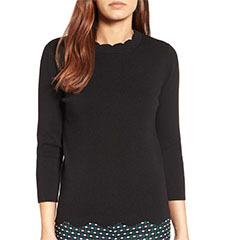 (ABOVE Talbots Long-Sleeve Embellished Turtleneck (Was $45, Currently $33.75). More Striped Turtlenecks Here, Here. During the winter, I often wear a patterned turtleneck under either a cotton or wool crewneck sweater. It’s a fun way to add interest to the sweater’s simple neckline. I thought this one was especially cute to wear without a sweater because of the message across the chest. I love how they paired it with a belt of the same color! 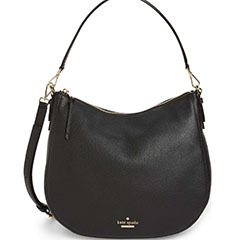 (ABOVE) Kate Spade Jackson Street Mylie Leather Hobo ($298; Available in 4 Colors). I have an almost identical Kate Spade Hobo that I featured in my recent Lunch at The French Brasserie post. It’s a similar color to the above Hobo in Porcelain. The Hobo is such a classic shape, and this one is particularly great because it also comes with a detachable cross-body strap. Mine didn’t. 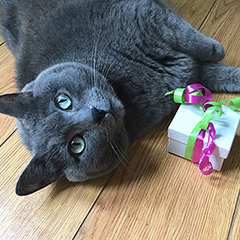 My guess is that this one is stuffed–mine was, too, when I bought it–so you can’t see how beautifully it will drape when you actually get it home and carry it. Still, even with all the stuffing, it’s a gorgeous hobo bag. This made me smile:”Yes, there are still lots of trends I don’t see myself wearing–some, in fact, that I can’t imagine anyone of any age wearing…ever–” Wouldn’t it be funny to do a “reverse” post, writing what you really think about such items? Oh my. I think it would be a hoot. “Fashion gone wrong.” Second topic: I visited Talbot’s just the other day and I’m not sure about the Eiffel Tower theme – wouldn’t someone in Paris who saw that think it’s kind of silly? Touristy? Third topic: This has to do with winter clothing. I wonder what you would recommend to those of us facing the prospect of VERY cold (parka-cold) winters. I agree about wearing what you want, but I listened to an episode on NPR about dressing a while back and one thought stuck with me, the emphasis should be on you looking nice not on your outfit. Sometimes with prints and certain colors they take away from this idea. You notice the print or color first then the person. Thank you so much for your well-considered reply. I’m probably more ‘gun-shy’ about the playful things (such as tropical-fruit themed necklaces that I’ve seen for sale at Talbots) as I can purchase only a limited number of items. But your approach is absolutely right – “if I really love something it doesn’t bother me that someone else doesn’t love it.” I think I’m already getting there. . . I already feel a lot more confident that I’ve finally found my style, and so much of it has to do with your influence. And thank you for the thoughts about winter wear!! It’s really helpful! And on the topic of difficult weather, I hope you and yours did well in the hurricane and storm conditions. As a retired architect and Interior Designer not to mention Image Expert and Clothing designer and manufacturer I know what my own closet looks like and i can only imagine what yours must resemble. lol Trust me on this one Janis i think of you each time i even look at my closet. I am currently looking for a new home having moved back to the States and the first thing i look for is a bedroom next to the MBR and adjoining BR that can be altered into a professional set of walk in closets for myself and spouse. ( Currently widowed; but it pays to be prepared for eventual resale and i can always use more closet space. lol ) I notice all the new homes now being built are designed with His & Hers Closets and BR’s.. But in older homes which predominate our area of high priced homes an adjoining BR is a must and it has to be a large one if the original MBR is not large. Since i know you favor older Tudor style homes they are not usually conducive to large BR’s or BR’s. This is one reason i think of you when i look at my own closet lol.. Not to mention we are both “Classical Clothes Horses.” Lol I say that with friendship and kinship ..Shoes take up a lot of space even well planned. Lots of organization. I bet you are very organized.Lovely informative post as usual..
Hello! 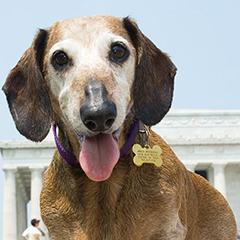 Janis, I recently came across your blog and You Tube channel and I am simply delighted that I did. Your posts are so detailed, honest, and really helpful! I adore the classic, feminine, pretty style that you cultivate so well. Thank you for sharing so much of yourself with us and please know that it is appreciated and beneficial! Oh my gosh, Janis, to be young and thin again! Just about everything I saw reached out to me. You have such exquisite taste. Thank you for brightening up this ugly rainy day. Oooooh, I LOVE Fall fashions! I am not a pink girl, but that trench is gorgeous. I hope you and your friend/family made it though Wilma OK. I do have a question about the slides sandals with more coverage that you featured: they seem to make a flip/flop sound when I wear them. Does they do that for you too? Otherwise, they are very comfortable. I live in Australia, and have just came across your youtube videos. I love your style, and you have such great taste. I like watching your videos, as you are such an inspirational and lovely soul, and I also love that you wear your hair long. I feel that we are the age we feel we are, and not to conform to looking a certain way as the years go by. Your beautiful young soul shines through, and I love your choices in matching up the items that you choose. Many blessings to you.